Blame the hardiest of those most resilient souls in business, the traveling salesman, the “road toad,” aka the business traveler. Credit goes to the guests – specifically the business travelers, and the business groups. 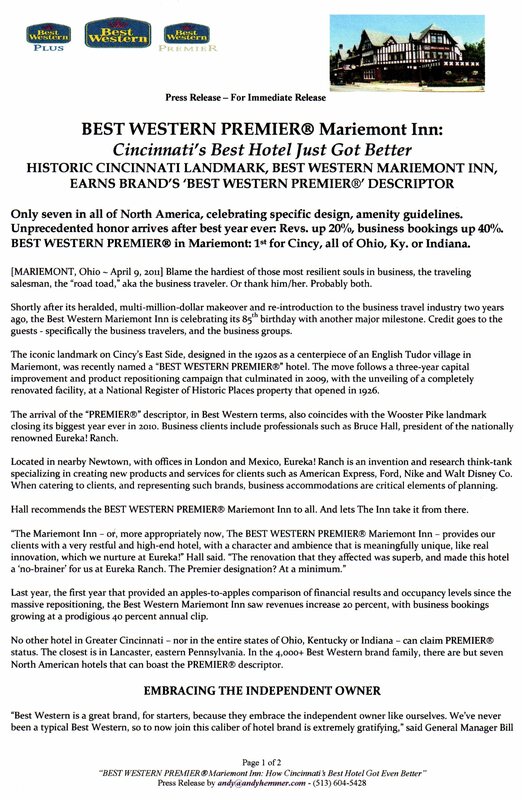 The iconic landmark on Cincy’s East Side, designed in the 1920s as a centerpiece of an English Tudor village in Mariemont, was recently named a “BEST WESTERN PREMIER®” hotel. The move follows a three-year capital improvement and product repositioning campaign that culminated in 2009, with the unveiling of a completely renovated facility, at a National Register of Historic Places property that opened in 1926. The arrival of the “PREMIER®” descriptor, in Best Western terms, also coincides with the Wooster Pike landmark closing its biggest year ever in 2010.
Business clients include professionals such as Bruce Hall, president of the nationally renowned Eureka! Ranch. Located in nearby Newtown, with offices in London and Mexico, Eureka! Ranch is an invention and research think-tank specializing in creating new products and services for clients such as American Express, Ford, Nike and Walt Disney Co. When catering to clients, and representing such brands, business accommodations are critical elements of planning. Hall recommends the BEST WESTERN PREMIER® Mariemont Inn to all. And lets The Inn take it from there. “The Mariemont Inn – or, more appropriately now, The BEST WESTERN PREMIER® Mariemont Inn – provides our clients with a very restful and high-end hotel, with a character and ambience that is meaningfully unique, like real innovation, which we nurture at Eureka!” Hall said. Last year, the first year that provided an apples-to-apples comparison of financial results and occupancy levels since the massive repositioning, the Best Western Mariemont Inn saw revenues increase 20 percent, with business bookings growing at a prodigious 40 percent annual clip. No other hotel in Greater Cincinnati – nor in the entire states of Ohio, Kentucky or Indiana – can claim PREMIER® status. The closest is in Lancaster, eastern Pennsylvania. In the 4,000+ Best Western brand family, there are but seven North American hotels that can boast the PREMIER® descriptor. The National Exemplar, house restaurant at The Mariemont Inn. “Best Western is a great brand, for starters, because they embrace the independent owner like ourselves. “We’ve never been a typical Best Western, so to now join this caliber of hotel brand is extremely gratifying,” said General Manager Bill Spinnenweber. “But here’s the bottom line: some people didn’t know where we were headed when we reduced the number of rooms, yet made them bigger, with the absolute best amenities a business traveler could ever want. “If we can get them to stay with us, they’ll understand. If they read our reviews on Trip Advisor – where we’re still the best-rated hotel in Cincinnati – they’ll understand,” Spinnenweber continued. “And now, by becoming a BEST WESTERN PREMIER®, there should be absolutely no confusion as to which way we are headed, and why,” Spinnenweber said. The BEST WESTERN PREMIER® Mariemont Inn has always been a family affair: three generations, from grandmother to father and now sons, contributed to the multi-million, multi-year transformation that concluded in early 2009. Becoming a BEST WESTERN PREMIER® – the crème de la creme in “The World’s Biggest Hotel Family,” a brand representing 4,000+ hotels in 90 countries – represents an unprecedented distinction. The process to earn the PREMIER® descriptor originally looked like it would take about three months. The Best Western Mariemont Inn started negotiating for the upgrade in August of last year, when the Spinnenwebers realized their own existing standards, protocols and amenities already exceeded many of the PREMIER® brand. 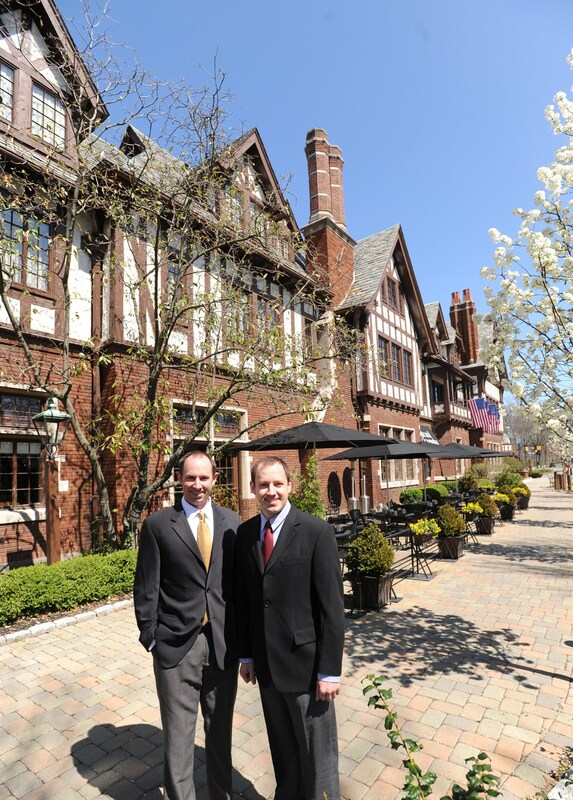 Mariemont Inn owners Dan Spinnenweber Jr., and brother Bill Spinnenweber. Certain aspects of the building, however – particularly due to its National Historic status, which details specific guidelines for facility upgrades, building renovations, etc. – extended the process. The new brand – and last year’s success – reaffirmed The Mariemont Inn’s focus on the business traveler. Business groups have increased their bookings by 40 percent, even with room prices hiked from $99-$109 per night to $169-$229 range. The cost is similar to a Downtown Cincinnati hotel, when factoring in taxes and parking. The differentiator is the BEST WESTERN PREMIER® greenspace; a pedestrian-friendly, safe and clean neighborhood with restaurants, shops, specialty retailers, a movie theater, Starbucks and Graeter’s. There’s also a on-premise fitness facility, business center, restaurant and bar. The final approval to become a PREMIER® was secured late last month. 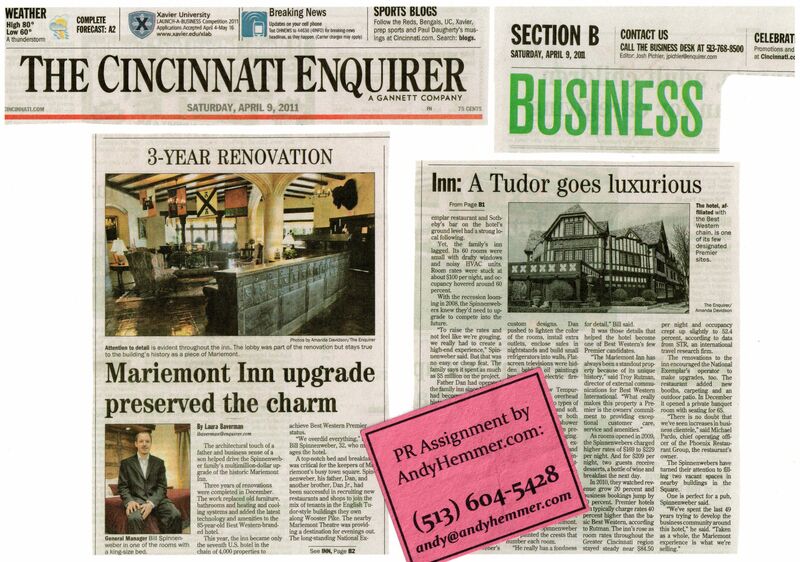 “Taken as a whole, the Mariemont Inn experience is what we sell,” concluded Spinnenweber. “We’ve spent the last 45+ years trying to develop the business community around this hotel. We’re known as best-in-business for Cincinnati. – Internet access is spectacular, anchored in a custom-built fiber-optic network underneath the building, with wireless connections throughout. Best Western International, Inc. is THE WORLD’S BIGGEST HOTEL FAMILYSM, providing marketing, reservations and operational support to over 4,000* BEST WESTERN®, BEST WESTERN PLUS® and BEST WESTERN PREMIER® hotels in 90 countries and territories worldwide. BEST WESTERN PREMIER Mariemont Inn: born in 1926. Now celebrating 65 years of hospitality, Best Western has grown into an iconic brand that hosts an estimated 400,000 worldwide guests each night. For more information or to make a reservation, please visit www.bestwestern.com. To reach the BEST WESTERN PREMIER® Mariemont Inn, please visit www.MariemontInn.com, visit us on Wooster Pike (15 minutes due East of Downtown Cincinnati) or call us at (513) 271-2100. For media inquiries, please contact Mr. Andy Hemmer, President of AndyHemmer.com PR at (513) 604-5428 or andy@andyhemmer.com. This place is flat-out gorgeous. The building is on the National Register of Historic Places, constructed in 1926. 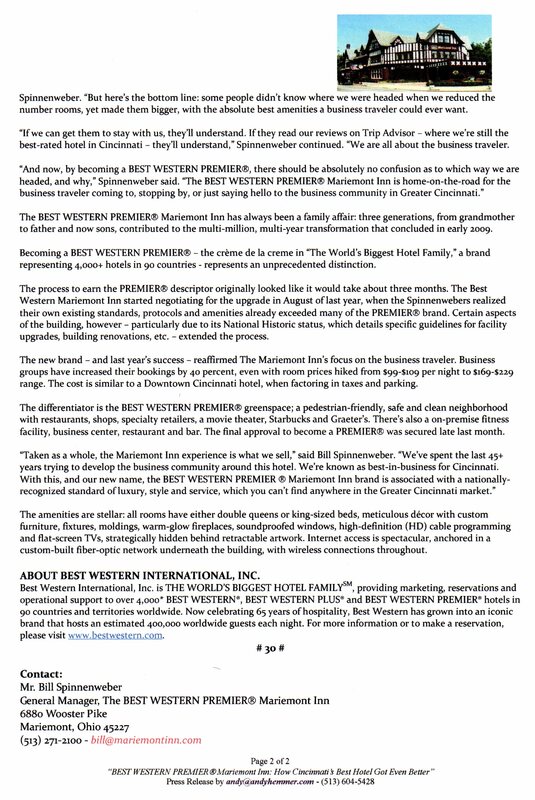 The BEST WESTERN PREMIER Mariemont Inn is the only Premier in Greater Cincinnati, and all of Ohio. None in Kentucky or Indiana; the closest is in Lancaster, Pa.